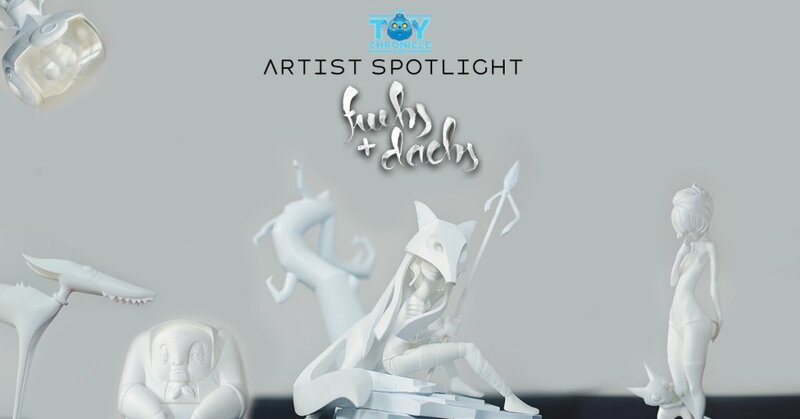 This month, The Toy Chronicle Artist Spotlight shines the light back on to Fuchs+Dachs! In 2015 Fuchs+Dachs wowed us at TTC HQ with their resin art collectables. They’ve recently re-launched their interior figure set which was premiered at DMY Berlin back in 2015. Fast forward to 2018 and the 5 sculptures have been revamped at a lower price point compared to 2015. Each still has a totally different look and feel, from each other from fun to elegance. Fuchs+Dachs are avoiding 3d print and serial production as much as they can so they can focus the quality of the outcome more. Experimenting with materials and ended up with their own mixture based on urethane resin. Fuchs+Dachs work is far too good to not show the world once again. It consists out of 3 elements – girl figure, changeable fox skin and tree and rocks figure base. Skin alone was made out of 6 carefully combined moulds. The skin is changeable and in the future, you could combine the figure with some other animal skin. The character is a girl hunter before the winter. In order to survive the cold wind, she hunts for meal and animal skin for protection. Since the disappearance of her tribe and family, she always hunts alone. The Wild One. Domesticated one is a Rare figure. It is beautifully sculptured one piece art toy. Unique mould technique lets us combine two characters from one moulding. It presents the artist girl in her domestic moments shared with her Siamese cat. Gentle curves of a female body form are opposed with sharp lines as symbols of a cat character. That unique bond makes this figure one of our most gentle and artistic in its form. Shadowplay of those forms makes this figure beautiful in all the light situations, dimmed corners or the bright, white spaces. The Domesticated One. Outspaced one is a Rare figure. It consists out of 3 elements – astronaut exoskeleton suit, changeable alien head and a clear plastic visor. It is all about space travels and dangers of outer space explorations. The visor is cracked, but there is still no air leak. Changing of the character head will represent a variety of alien spices we could encounter in the deep space. Character’s visor cracked during explorations in one of the caves of Ceres, largest asteroid in the Asteroid belt. One of the rocks fell off the cave ceiling, damaging the thick visor glass. If you remove the alien figure, you can use the Granny as a secret stash. We all know what you like to keep in there. Granny will keep all the nature stuff safe and secret. The Traditional one. Tamed one is an Uncommon figure. It is one piece fox character with a chicken leg. Usually, foxes are smart and cunning. But not this one. This one tries so hard, but nothing good comes her way. She is always attacking chicken boxes of the area, but usually ends empty-handed (or empty-pawed). During one of those “missions” she managed to get the largest chicken in her life, but in the same time she lost her leg. We still do not know how the accident happened, nor how she managed to fix her self with a leg of a largest chicken, but since that time she is known as The Tamed One. The figures are hand-crafted and cast in a silicone mould with high-quality urethane resin. They are produced in a very small limited series, each piece comes in a nice packaging containing production number, handmade certificate, a stamp of the studio and signature of the artist. Hopefully, someday we can check out The art of Fuchs+Dachs in person and admire them all in person, see if they look as good as the photos. You can explore the sets at http://fuchsdachs.com/ in more detail. Fuchs+Dachs work was featured on over 20000 publications, magazines and pages including WIRED, DESIGNBOOM, Mashable, Vanity Fair International, the Rolling Stone magazine, Gizmodo, Taxi, Tachen, D&Ad… so It was only right that we would feature Fuchs+Dachs on The Toy Chronicle. “Fuchs+Dachs started its journey at the moment when Sanja and Dušan had first met. Unchained and energetic creative freedom of the fox clashed with conceptual logic and grumpiness of the badger. Creatively, it was a perfect match. They shared the passion for character design and animated movies, therefore creating a character design studio was simply a natural decision. Shortly after, Nikola joined the team bringing in the hard facts – the huge amount of technical knowledge and the deadeye precision of beaver engineering. You can find Fuchs+Dachs via fuchsdachs.com and Facebook.